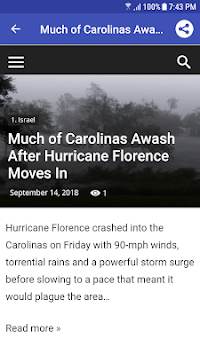 Read Israel News in English everyday for FREE with “Israel News English App | Israel Newspaper app”. Aside from exclusive National news, you can also read World news, Sports News, Entertainment News, Business News, Health News, Politics News, Travel News, and Science/Tech News. If you are Israeli or live in Israel, you’ve got to install our app on your phone. And it’s FREE! 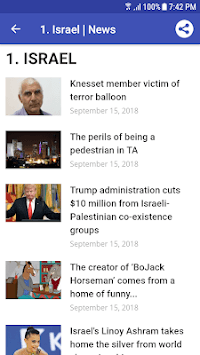 There is no need to download separate Israel news apps from each Israel News paper in English or media. 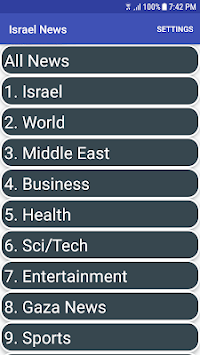 You can read news from all top news Newspapers in the world and Israel here. Just open our app and browse the Section to read about things you’re passionate about. Want to read about the latest Israel politics or the latest trends in Israel? Just go to the “Israel” tab to read all about it. Eager to read about latest hit songs from your favorite bands? Go to the Entertainment section. Everything is here within your fingertips, with just a few touches, you will get every news you need. Download our app and read Israel news for FREE! Read news about various subjects, from Business, Entertainment, World news, and a lot more. Our news sources are reputable and reliable and will give you factual information you need. Very simple to use. With just a few taps, you can access all news Sections easily. Use our Search function to look for news about specific things. No need to download multiple apps to read news from multiple sources. Great app design that focuses on maximizing our user’s experience. Browse by News Sources, read news from your favorite websites. So, if you need a reliable app to read Israel news, don’t wait any longer. Download “ Israel News app| Israel News in English” now! It’s FREE and simple to use.